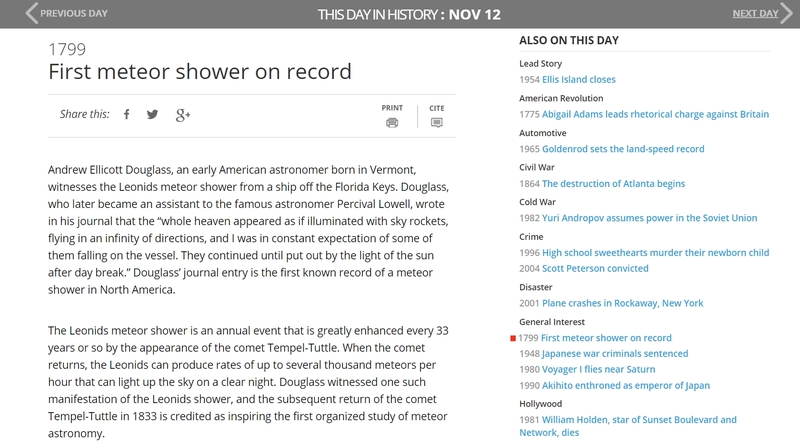 On November 12th, 1799, the first known record of a meteor shower in North America was written in the journal of a witness observing the Leonids from the deck of a ship in the Florida Keys. 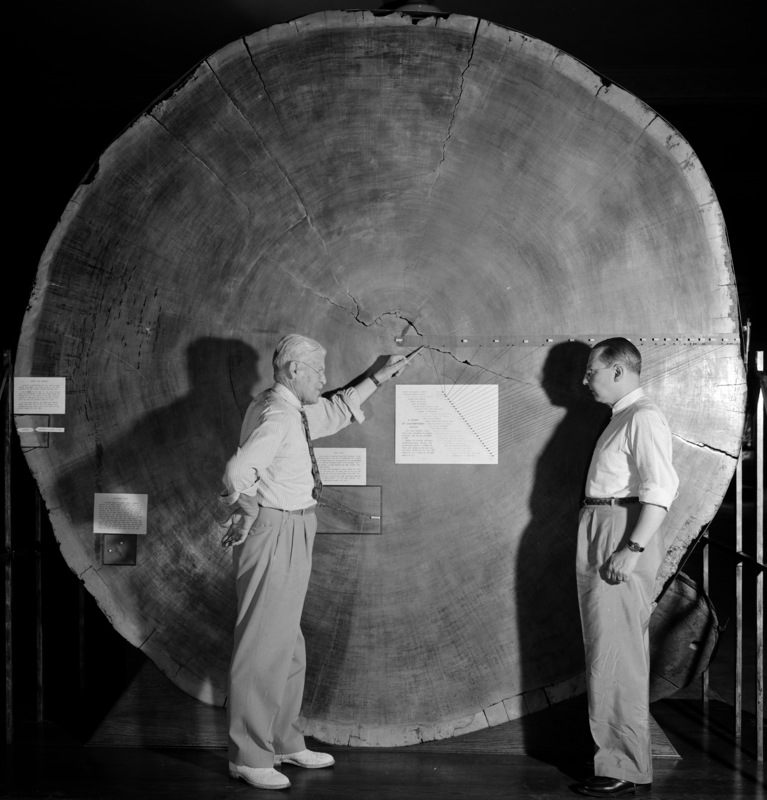 The occasion is marked in many an iteration of “This Day in History” entries, but in almost all of them there is a glaring error: the journal entry is attributed to Andrew Ellicott Douglass, an astronomer and founder of the modern science of dendrochronology who was born in 1867, 68 years after the Leonids put on such a spectacular show in the Keys. The real observer of the 1799 Leonids meteor shower was Andrew Ellicott, a surveyor who was in Florida on assignment from President George Washington to ascertain the official boundary line between the United States and Spanish territory as negotiated in the Treaty of San Lorenzo. About two o’clock in the morning I was called up to see the shooting of the stars (as it is vulgarly termed), the phenomenon was grand and awful, the whole heavens appeared as if illuminated with sky rockets, flying in an infinity of directions, and I was in constant expectation of some of them falling on the vessel. They continued until put out by the light of the sun after daybreak. This phenomenon extended over a large portion of the West India islands and was observed as far north as St. Marys where it appeared as brilliant as with us. The Leonids show up annually around this time and sprinkle light in the sky at the rate of about 20 meteors per hour, but every 33 years they put on a glorious light show with thousands of meteors per hour showering the sky. 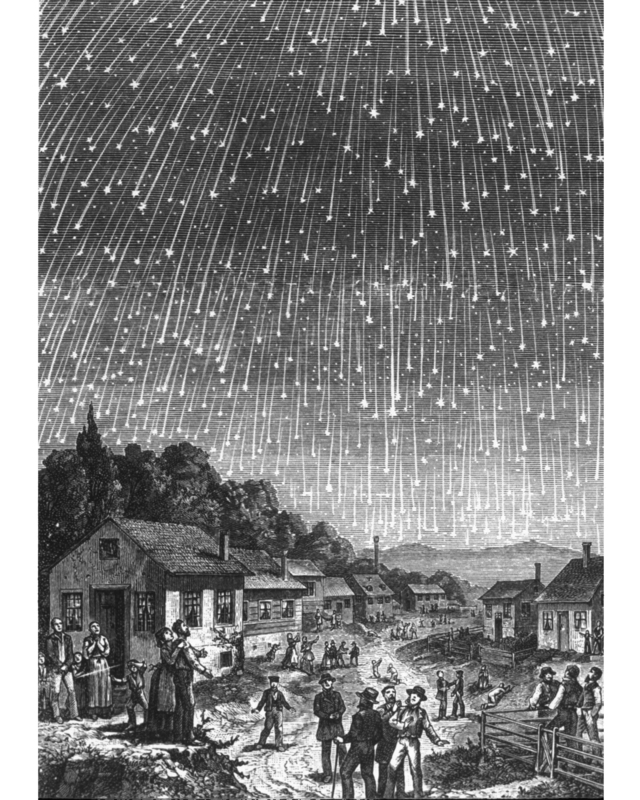 The 1833 storm was so strong at least 100,000 meteors, and maybe double that, streaked over North America in nine hours. The 1799 storm was just short of the peak of the cycle, but it was exceptionally strong nonetheless, which is why Ellicott hauled his cookies out of bed at two in the morning to see the show. Many ingenious theories have been devised to account for those luminous and fiery meteors, but none of them are so satisfactory to my mind as the conjecture of that celebrated chemist M. Lavoisier, who supposes it probable that the terrestial atmosphere consists of several volumes, or strata of gaz or elastic vapour of different kinds, and that the lightest and most difficult to mix with the lower atmosphere will be elevated above it, and form a separate stratum or volume, which he supposes to be inflammable, and that it is at the point of contact between those strata that the aurora borealis, and other fiery meteors are produced. Andrew Ellicott was renowned in his time for his great accuracy in surveying, determined in large part by his celestial observations. Born in 1754 to a large Quaker family of modest means in Pennsylvania, Ellicott fought in the Revolutionary War ultimately rising to the rank of major. After the war he worked with James Madison and David Rittenhouse continuing the survey of the Mason-Dixon line that had been abandoned during the conflict. He turned out to be really good at it. In 1786 he was commissioned to survey the western border of Pennsylvania, a meridian that is still today known as the Ellicott Line. In 1792 Secretary of State Thomas Jefferson appointed Ellicott to survey the boundaries of the federal Territory of Columbia, which would be renamed the District of Columbia nine years later. That same year he surveyed the land that would become the city of Washington, then forming the nucleus of the Territory rather than the entirety of it. He worked with Pierre Charles L’Enfant on the plan of the city until L’Enfant pissed off the Commissioners overseeing the project enough to get the boot. 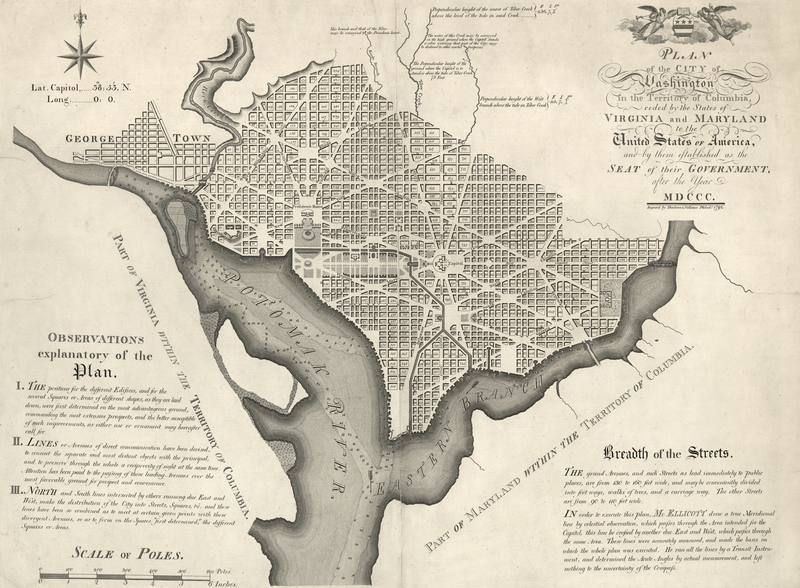 Ellicott’s revised plan of Washington (which L’Enfant strenuously opposed) became the basis on which the capital was constructed. In 1796 George Washington gave him the biggest assignment yet: surveying the border between Spanish North America and the United States. He spent four years travelling the Ohio and Mississippi rivers, the Gulf Coast and into Florida, deploying impressive diplomacy and patience in his dealings with Spanish commissioners, and recording everything in his journal. Another one of his boundaries that is still called Ellicott’s Line remains today the border between Alabama and Florida. After that bear of a job was done, he moved to Lancaster, Pennsylvania where, among other things, he taught Meriwether Lewis how to survey in preparation for his great expedition to the Pacific with William Clark. In 1813 he took a job as Professor of Mathematics at the Military Academy at West Point. His last survey was in 1817 when he helped establish the western border between Canada and the United States as defined in the Treaty of Ghent. Andrew Ellicott died of a stroke on August 28th, 1820. The Geography of our country, in particular, is indebted to him for many interesting details, and descriptions of its unfrequented parts, as well as for the most accurate adjustment of the relative situation of particular places. By his death, science is deprived of a devoted admirer — the Military Academy of one of its best friends and most distinguished Professors — society of a benevolent & useful member, and his family of a tender husband and a kind and affectionate parent. We should all wish for such a glowing and meaningful final assessment. What a pity, then, that the record of this great man has been erroneously subsumed into the life of another. I suspect the error originated with History.com and then spread around in the usual pattern of Internet epidemiology. I have emailed the site to let them know of the mistake, but I’m afraid there’s no putting the toothpaste back in the tube. Over much of the web, Andrew Ellicott will be denied his seminal astronomical observation, his rich contributions to the history and geography of the United States and even his very name while Andrew Ellicott Douglass, who has many genuine accomplishments worthy of This Day in History lists, will be taken out of his time and saddled with posthumous plagiarism of his own great-grandfather. Yes, the name is not a coincidence or a distant tribute. Andrew Ellicott’s daughter Anne married David B. Douglass and they had a son named Malcolm. Malcolm Douglass and his wife Sarah Hale named one of their sons Andrew Ellicott after his illustrious great-grandfather. This entry was posted on Wednesday, November 11th, 2015 at 11:51 PM	and is filed under Modern(ish). You can follow any responses to this entry through the RSS 2.0 feed. You can skip to the end and leave a response. Pinging is currently not allowed. A remarkable story, wonderfully told.